A violinist wants to order one of my cases, and wishes that the case be lined in a polyester velour of his liking. He has a Strad and a Vuillaume, and personally I'm worried about the reaction that the material may have with the varnish in hot weather. Can anyone provide me with personal experiences? Horror stories? Or is polyester OK? I don't have any specific experience with different materials for linings. What material do you currently use? If a silk bag were used all of the time, there shouldn't be a problem, but how do you guarantee that they would do that? In any case, a signed, witnessed, release from all liability might be in order. What material do you currently use? If a silk bag were used all of the time, there shouldn't be a problem, but how do you guarantee that they would do that? In any case, a signed, witnessed, release from all liability might be in order. I try to use only natural materials such as cotton, silk, and viscose (which is a semi-synthetic, a.k.a. rayon). Anything else has been tested extensively before use, with a variety of varnishes and temperature/humidity conditions. The problem here is using a material which to us is completely new and here I have some time constraints. Not that it’s any of our business, but why would someone with valuable instruments want to have what is usually associated with less expensive cases be used in a very expensive case? Seems like an unnecessary risk for the buyer to select a material other that what has already been successfully used with valuable instruments. But I suppose they could be providing the velour material to you and the material itself may have some sentimental or other intangible value to the buyer. Polyester is a very stable and inert material, and I cannot see any reason that it would react chemically with a dry violin varnish. 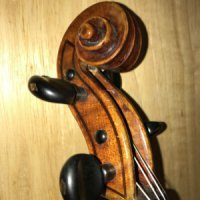 I've never had and problems with polyester on hot or humid days sticking to either my spirit varnished or oil varnished viola. You are a great master of your trade and if I was commissioning a case from you ( as I would wish one day!) I would be asking your advice and not ever dictating materials. You can furnish the most exquisite natural cloths but your client asks for some unproven cheap synthetic flammable polyester that will probably degrade much faster than the natural fibers you know and trust. In your position I would simply reject the commission. The customer is not showing you the respect you deserve. Thank you, everyone. And I especially appreciate Melvin's comment because he hits the proverbial nail on the head. After 36 years in the field I may have learned a thing or two. This isn't the first time I find myself in a quandary like this. Some time ago, an A-list soloist wanted to order one of my cases, but insisted that I substitute the time-proven latch that I use with the pinch-type GEWA-style lock by Sudhaus in Germany. Aside from the fact that I dislike that model for a number of reasons, principally because the case may look closed when it's not, and when you pick up your case your Strad tumbles out, but Sudhaus no longer makes it, and only Chinese copies are on the market. So I refused to change the lock - I didn't want any responsibility towards this guy's Strad if the lock broke - and lost the sale. 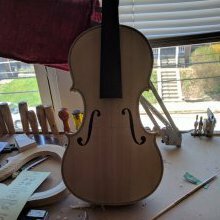 Just curious: how do you violin makers deal with unreasonable requests? Not that it’s any of our business, but why would someone with valuable instruments want to have what is usually associated with less expensive cases be used in a very expensive case? I agree entirely, and in fact purchased a beautiful velvet in the exact color desired, a mix of cotton and viscose to give it a particular sheen. Nope, not approved by the client. (I'll use the material for another case, don't worry). Silk velvet tends to have a dull appearance, while this client wants something lustrous. I kick 'em to the curb (suggest they go elsewhere). Assessing just the relative risks to your business, declining the business is the lowest risk course of action. Even if they bad mouth you to other players for not being willing to accede to their request, your existing reputation will more than withstand that. The highest risk is that you do what they ask and something bad happens to their instrument -- heaven forbid. In that event, their bad-mouthing can begin to erode your reputation (though I would say it would take several such incidents to have that kind of effect in your case). 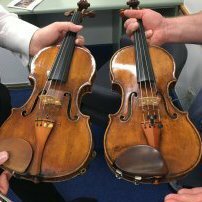 And, by the way, you would never asked them to play Paganini left-handed behind their back (assuming they are right-handed). So why should they ask you to change your formula for success? It's hard to explain to people they have no taste. Just find a friend who works at a museum to lie for you "our findings show that it may be dangerous" you wouldn't want to jeopardize the integrity of the instrument over some polyester, would you?" Well - if they insist, I'd make them sign an addendum to their bill of sales, saying that you are not responsible for any damage the lining may cause ANY instrument placed on the lining, since you are not familiar with the chemistry of the lining. I understand the appearance of luster of the polyester but that material seems "hard" to me and I would think it would be more abrasive to the varnish than natural textiles. Imagine millions of tiny plastic scrapers contacting the finish of your instrument. Speaking of thoughts along this line, how often do instrument owners attempt to have case manufacturers held responsible for instrument damage from falls, bumps, temperature, humidity or any other reason they can come up with? Not asking about Musafia necessarily, but is this a common occurrence in the industry? I would guess that owners try to blame the higher cost manufacturers more that the cheap ones though because the case owner may assume that high $$$ automatically equals high protection. "Don't you think the luster of the polyester just distracts from your stunningly beautiful instrument which ought to be the center of attention?" Then again, if they have their heart set on poly, appealing to their vanity may not work either. I have had rather slick fabrics "print" on the ribs of a violin. It's hard to predict. I think the sort of plush that you use is about the best stuff. Some instruments have soft varnish that may have problems no matter what. As to a chemical reaction I haven't a clue. I suppose it's possible but it might be in the realm of an organic chemist. If I was the person involved I would go with your ideas and maybe use their fabric just for accent and not in contact with the fiddle. Ideally, museum storage and display environments should be free of all reactants that can interact with objects. This ideal is not (usually) a realistic expectation: many artefacts may be sources of corrosive agents that will interact with other objects. Anyway, increasing access to objects inevitably increases the rate of their degradation, if only by exposing them to radiation necessary for them to be seen and keeping them in climates that are appropriate for visitors. Use sacrificial materials preferentially to react with the corrosive species. For those wondering, if I decide I don't want to take up a project, I have two solutions: if it's a question of materials or components, I simply say that I am unable to source what they are looking for; if it's a question of design, I will recommend them to a colleague. Never any hard feelings. Regarding the issue of product liability, we put enough clauses into our warranty to cover our necessities, but so far I have never heard of any issues of a case manufacturer being asked to take responsibility for instrument breakage. And that despite the millions of truly dangerous cases out there, that are used even to carry Strads (and I mean it). It would be like driving your BMW into a tree, becoming injured, and then suing the folks in Munich. Might as well sue the tree. It would be like driving your BMW into a tree, becoming injured, and then suing the folks in Munich. Might as well sue the tree. Congratulations on coming to a solution. I had to look up viscose. Interesting product that's made from wood pulp. I know you do a lot of testing. Have you tested the water vapor absorbance of different materials? I remember the days when I worked in the polar regions where the saying was "cotton kills" because it holds water and if you sweat with cotton against your skin it will freeze. Instead, we always wore polyester or polypropylene that has a more hydrophobic nature. I am thinking the ability to absorb water vapor can act as a buffer to changes in RH. Just a thought model. I don't if it would actually work that way or if the difference would be meaningful. Have you tested the water vapor absorbance of different materials? I remember the days when I worked in the polar regions where the saying was "cotton kills" because it holds water and if you sweat with cotton against your skin it will freeze.